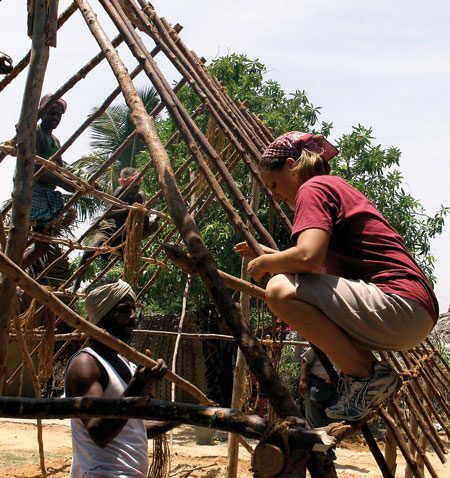 When Amy Antonelli (BA ’03) felt guided to leave her top job at Apple to work in undeveloped India, she wasn’t really surprised. She credits her willingness to the stories her parents read to her as a child. “I grew up hearing the stories of the scriptures, so it wasn’t a big deal when Heavenly Father asked me to move across the world to India. He had asked Nephi to move around the world,” Antonelli says. Now she reads stories to children—174 of them—as executive director of the nonprofit organization Rising Star Outreach, which aids members of leprosy colonies in India. One of Rising Star’s main initiatives is to provide a school for the children born into leprosy colonies. Many leprosy-affected adults allow their children to attend the Rising Star school, where the children are fed good meals, read stories, and taught English—“the real key to breaking the leprosy-begging cycle,” says Antonelli. And if these children happen to contract leprosy, they can be treated with medicine costing only $1.50. Unfortunately, Indian people are often afraid to seek medical help for leprosy because of the social stigma. “In India, if people can see that you are leprosy-affected, you are done. You are a beggar,” Antonelli says. “That’s one of the biggest tragedies, because it’s so easy to cure.” If those with leprosy don’t receive help, eventually their faces, limbs, and other parts of their bodies will be damaged for life. As executive director of Rising Star, Antonelli’s responsibilities vary from traveling to the leprosy colonies to meeting with governors and princesses of India to playing with the Indian children. In 2005 Amy Antonelli left a prestigious job in California to work with leprosy colonies in India. As executive director of Rising Star Outreach, she combines business smarts with boundless love for children. Antonelli’s life course changed when she visited India just days after the Indian Ocean tsunami of 2004. The devastation and suffering were a shock to her, but even more disturbing were the leprosy colonies. “Here I was feeling as if my life was so derailed because I wasn’t a mother yet. I went into these colonies, and I saw what it really meant to have your life derailed. All I wanted to do was help them,” she says. The visit prompted Antonelli to leave her job as a spokesperson at Apple and move from California to India. In addition to Antonelli’s love for the people, her business experience has been crucial to the growth of Rising Star, says Douglas, who began the organization around her kitchen table in the United States in 2002. Since Antonelli’s entrance, the program has grown from a single house with 27 children to a large campus with 174 children, equipped with a medical van and staffed by many volunteers.